Posted on June 23, 2014 by admin Posted in Pork, Recipes	. Heat you smoker between 225 and 250. Your ribs should not be brought to room temperature before being put on your smoker. If your butcher hasn’t taken the membrane off the underside of your ribs remove it from the ribs. Sprinkle a rib rube of your choice on the meat sides of the rib and gently rub into the meat. Turn the ribs over and sprinkle the rib rub into underside and gently rub into the meat. 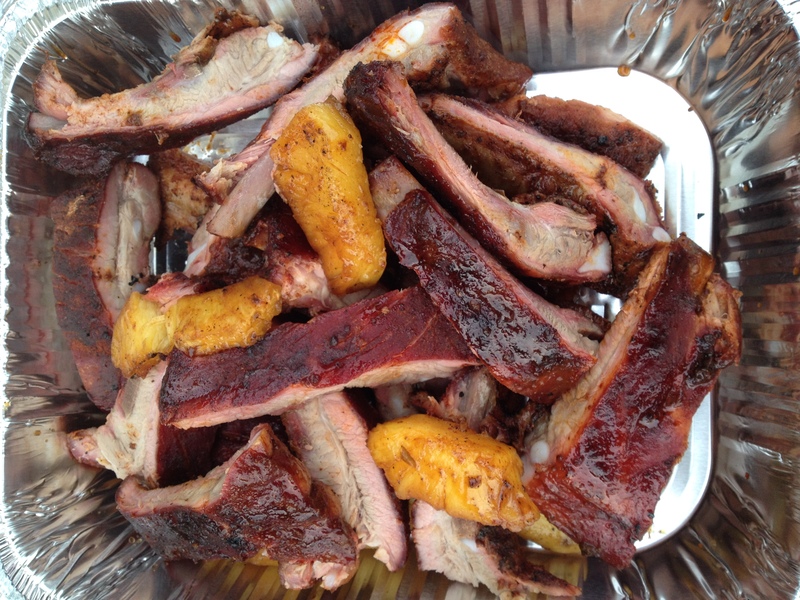 Pull your ribs and place them in heavy duty aluminum foil and place 2 to 3 slices of pineapple on the ribs. Wrap the ribs in the foil and cook for another 1 to 1 ½ hours. Open the foil packet but do not remove the ribs. And cook for another 1 to 1 ½ hours depending on your tenderness preference. During this step, glaze your ribs every 20 minutes with Bentley’s Batch 5 Sweet Barbecue Sauce. Tags: Bentley's Batch 5 Sweet Saint Louis Style Ribs	.